Congressman Ron DeSantis, R-Palm Coast, traveled to Donald Trump’s neck of the wooods in South Florida Monday morning to launch his bid for Florida governor, delivering a speech heavy on conservative principles but light on state policy. Donald Trump's guy for governor traveled to Donald Trump's neck of the woods in South Florida Monday morning to launch a bid to hold the state's highest office, delivering a speech heavy on conservative principles but light on policy. 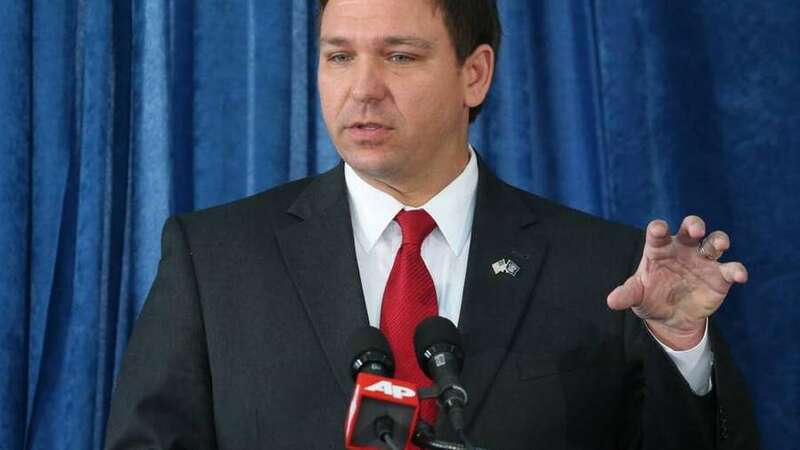 Ron DeSantis, a three-term Palm Coast congressman and former military prosecutor who served at the detention center at Guantanamo Bay, name-dropped the president and blasted sanctuary cities during a 25-minute speech inside a crowded ballroom at the Embassy Suites in Boca Raton. Comparing himself to term-limited Gov. Rick Scott, DeSantis promised to clean up the state capitol and cast himself as the outsider in a Republican primary that features Agricultural Commissioner Adam Putnam and may soon include House Speaker Richard Corcoran. "We Republicans, we can't have the insiders pick the candidate in 2018," said DeSantis, who came to the stage holding his 14-month-old daughter, Madison. "We need someone who's going to follow Rick Scott's legacy and shake things up." The Fox News darling hit on his desire to bring term limits to Congress, his efforts to end secret harassment settlements for Congress members and staff, and his belief that the nation's founding principles are "as relevant as they've ever been." But while the audience learned his batting average at Yale University — 90 points better than former President George H.W. Bush — they didn't hear what he thinks about giving public money to pay for charter school facilities, Scott's controversial Enterprise Florida business subsidy program or many of the other hot-button issues at the state capitol. "I haven't looked at it yet," DeSantis said when asked his thoughts on the upcoming November ballot question to restore the voting rights of more than 1 million of Florida's convicted felons. "But I'll look at it." DeSantis, 39, announced he was running for governor Jan. 5 on Fox News after Trump endorsed him in a tweet. The Harvard-educated attorney has recently bolstered his already conservative credentials and name recognition by attacking special counsel Robert Mueller's investigation into Russian meddling in the 2016 election. DeSantis said after his speech that he chose Boca Raton, a right-leaning city not far from Trump's Palm Beach Mar-a-Lago retreat, in part because of his support in the Jewish community. The congressman was among the advisers who pushed Trump to announce the U.S. would move its Israeli embassy to Jerusalem and declare the city the undivided capital of Israel. "You heard about my leadership on moving the embassy from Tel Aviv to Jerusalem," he told the Miami Herald. "I got a lot of support from people in Boca who said, you were the guy who was out there on it, and I think that's part of the reason why we had a good crowd today." Ron Krongold, a Coral Gables businessman and a director of the Republican Jewish Coalition, said after a private breakfast between DeSantis and some supporters that the Jacksonville native has become the state's champion in Congress on diplomacy with Israel. Boca is also home to some of DeSantis' biggest supporters, including Home Depot Co-founder Bernie Marcus, who gave $250,000 to the Fund for Florida's Future, a political committee with DeSantis ties. DeSantis was introduced by Jeniffer González-Colón, Puerto Rico's only (non-voting) member of Congress, who called him a "man of his word." DeSantis promised during his speech to crack down on an opioid epidemic hitting the state, ensure students graduate with a "sense of what it means to be an American," and promised to appoint conservative district and state Supreme Court justices. And then he ended with a call to conservatism. "I will fight for what is right and I will fight for our taxpayers and families," he said. "Thank you. God bless. And may the fair winds of freedom follow you home."